The third out of a class of four anti-submarine warfare stealth corvettes was commissioned into the Indian Navy this week. The third of four planned anti-submarine Kamorta-class stealth corvettes, INS Kiltan, was commissioned into the Indian Navy on October 16 during a ceremony held at Naval Dockyard Visakhapatnam in the Indian State of Andhra Pradesh, the Indian Ministry of Defense (MoD) announced in a statement today. The 3,500-ton INS Kiltan “is one of the most potent warships to have been constructed in India,” according to the Indian MoD. The stealth warship has been specifically designed for anti-submarine warfare, but they can also be deployed in anti-surface warfare (AsuW) and anti-air warfare (AAW) missions. The corvette purportedly has enhanced stealth features resulting in a low radar cross section and a low underwater acoustic signature (due to a noise-surpressing raft-mounted gearbox. 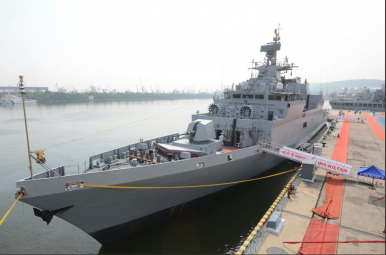 The INS Kiltan is reportedly the first Indian warship with a superstructure entirely made of composite material. The ship has been fitted with a modern 16-cell vertical launching system (VLS) for firing Barak surface-to-air missiles or locally produced long-range surface-to-air missiles system (LRSAM). The INS Kiltan also features four heavyweight torpedo tube launchers, a pair of 12-barreled RBU6000 rocket depth-charge launchers, and a 76-millimeter medium range gun, as well as two multi-barrel 30 mm guns as close-in-weapon system (CIWS). “She is also fitted with indigenous missile decoy rockets (Chaff) and advanced ESM (Electronic Support Measure) system to detect and map enemy transmissions and direction finder equipment,” the MoD said in a statement. “The ship boasts of a highly advanced Combat Management System and a sophisticated Integrated Platform Management System.” The ship’s weapons and sensors suite is predominately indigenous. The ship will also be equipped with a Humsa-NG bow-mounted sonar and an Atlas Elektronik towed array sonar system. Carrying an anti-submarine warfare (ASW) helicopter, the ship will be a ‘silent killer on the prowl,’ according to the Indian MoD. As of now, however, the ship still lacks advanced towed array sonar and a suitable ASW helicopter.“An ASW corvette without towed array sonar and an ASW helicopter, is nothing more than a feeble joke”, a retired navy commodore told the Business Standard. Are India’s US-Made Sub-Hunting Planes Not Meeting the Indian Navy’s Operational Requirements? India’s Comptroller & Auditor General has accused the defense ministry of violating procurement processes, among other things.